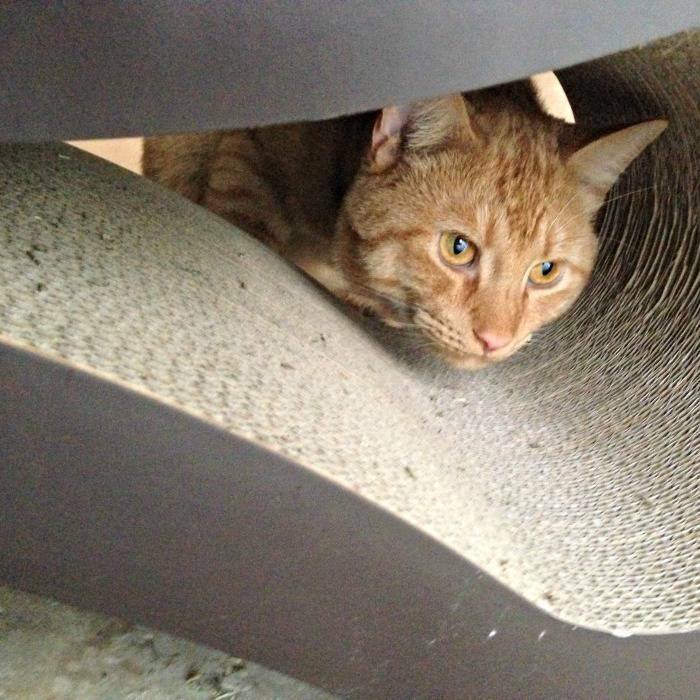 Looking for a better cat scratcher with the looks to match? 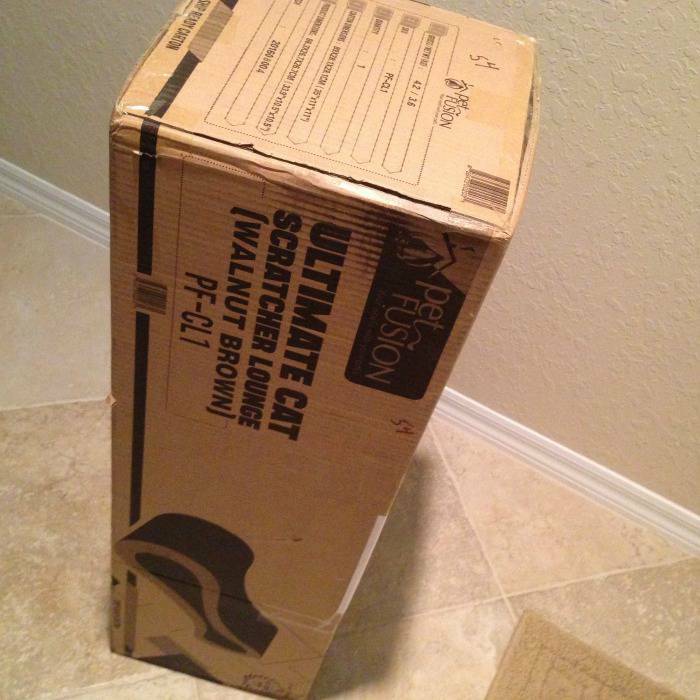 My free PetFusion Ultimate Cat Scratcher Lounge arrived safely at my house, courtesy of the folks at PetFusion. 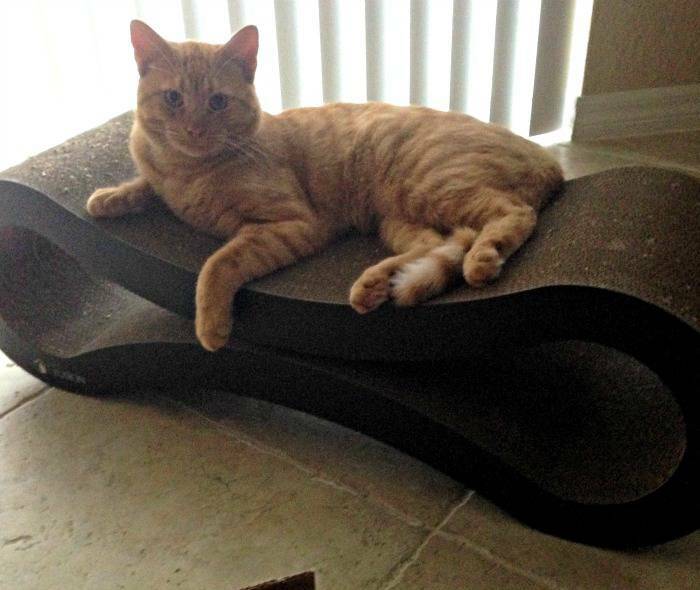 "The Lounge" offers a modern, uniquely shaped, and unmistakably curvy alternative to flat or slanted scratching boards and vertical cardboard scratching posts. Check out my 6 month progress update below. Luckily for me, one of the perks of building an amazing community of cat lovers is that sometimes, I get free products to try out. This pleases Jazzy, and in return, he works hard to test out the items. In this case, he was treated to a unique cat scratcher by PetFusion, as he seemed a bit bored with the flat cardboard one he already had. It arrived one day, in an unassuming brown box. It was announced with no fanfare, and only the ring of the doorbell indicated its presence. The delivery guy scurried off, like a mouse hoping not to be seen. It was not adorned with jewels, nor anointed with oils, and it didn't make a sound. 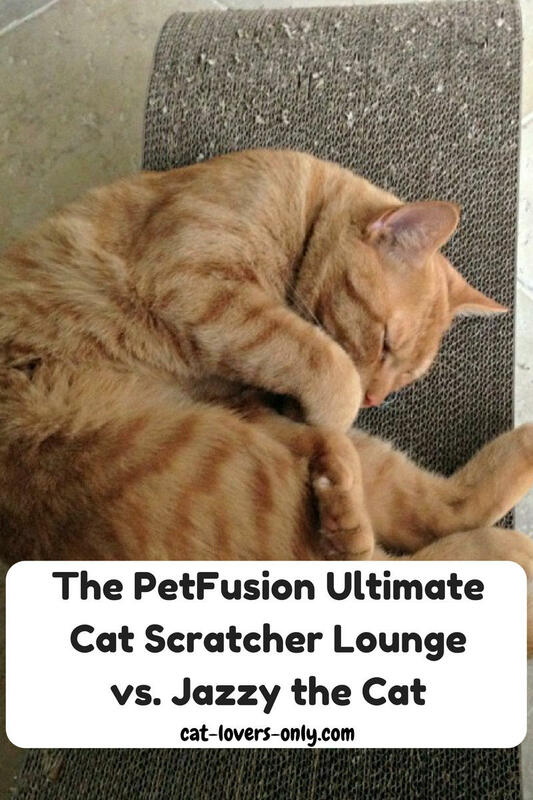 The PetFusion Ultimate Cat Scratcher Lounge has arrived! 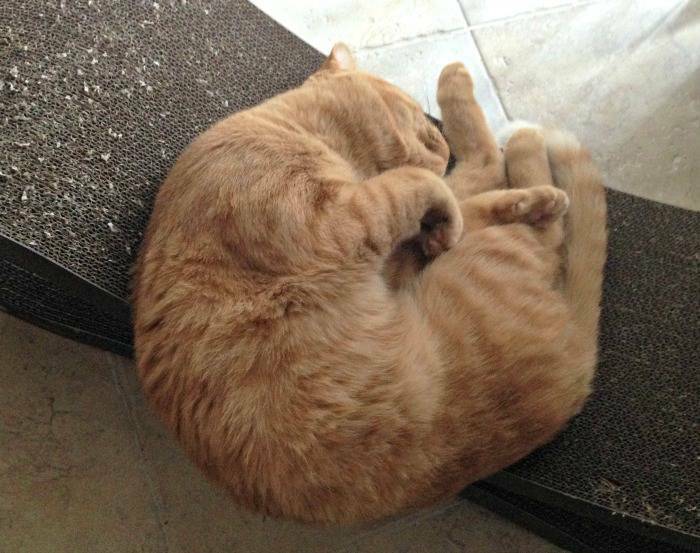 When I told Jazzy that the PetFusion Ultimate Cat Scratcher Lounge had arrived at the door, he was quite pleased. Actually, we both were, and it didn't matter to me that he was more excited about the box it came in than anything else. You see, like many of my readers' cats, Jazzy has been using his ninja skills and pointy ends to rip up some of the stuff in the house I consider important (like the furniture and the carpet). His flat cardboard cat scratcher helped, but I've had to encourage him to use it, and frankly, it was never much of a game changer. Does your cat have a "go to" scratching spot, other than your furniture, your carpet, and other objects you don't want destroyed? 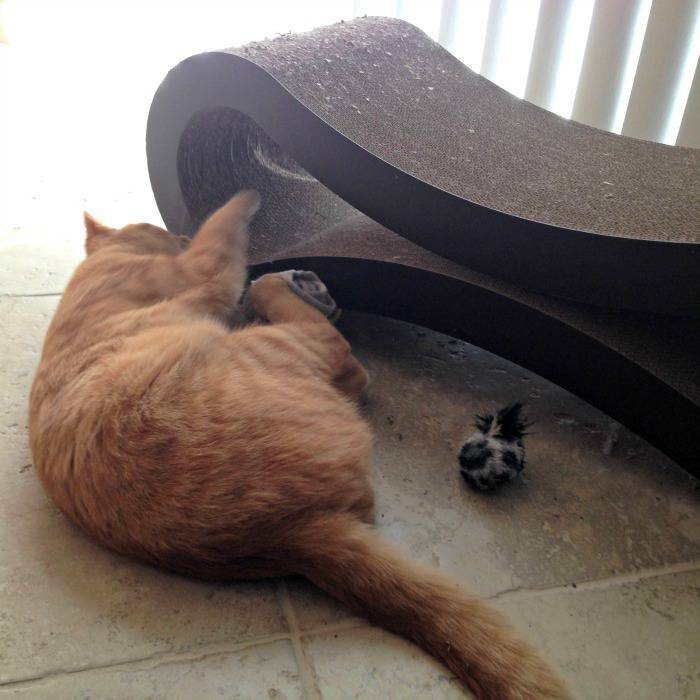 Have other cat scratching posts or boards failed to capture your cat's attention? This PetFusion model may be just the thing that makes your cat's paws happy. Of course, Jazzy thought I had gotten him the ultimate gift-a box! He would soon find out it was much more. He's always curious about visitors, and came to greet and investigate the cardboard intruder. Like stripes on fur, he was all over it. 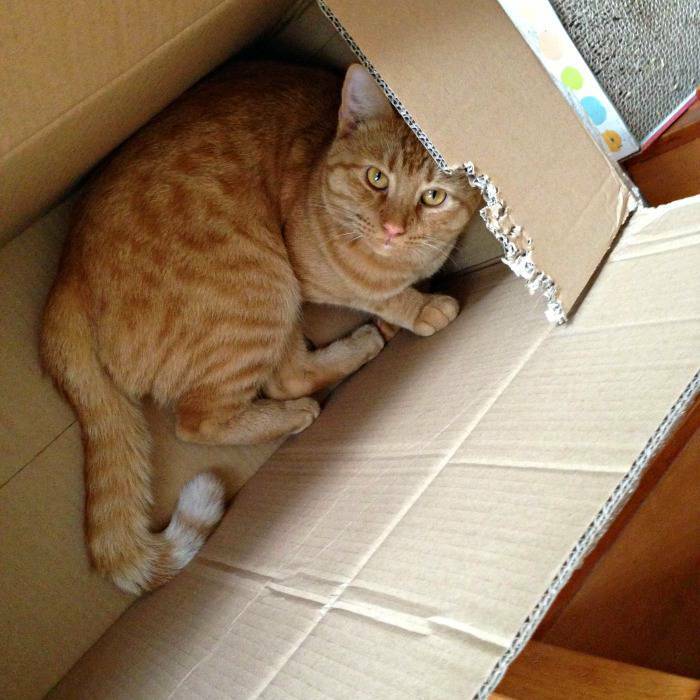 He patiently waited as I unboxed the prize inside, making a small effort to help speed the process. He was rewarded, for the unboxing had its own benefits. No self-respecting cat would pass up the chance to test out a box, and Jazzy wanted to ensure it was up to his standards. It passed. And passed again. And again. One of the flaps even makes a good snack. In fact, the box has become a fan favorite, and I'm reluctant to take it away. What was inside the box, though, turned out to be even more intriguing. It makes a great elevated cat yoga platform. Of course, that is if you can stay awake. Wake up, Jazzy! In addition to all the benefits of scratching, such as reduced stress, maintaining the claws, and stretching, the Lounge has become a center of activity. It's quickly become Jazzy's go to scratching place, but it's also a play center of sorts. He likes to stalk and pounce on his toy balls or rolled up socks using the Lounge as cover or something to grab onto. See the action shot below! There's also a weird side effect (in a good way). The Ultimate Cat Scratcher Lounge seems to have inspired Jazzy to use his boring flat cardboard scratching pad again. He's used it more in the last few days than he has in weeks, as he hops back and forth between the two products. This was an unexpected surprise. So What's Different (Pros and Cons)? How has life at Casa de Cat Lovers (AKA Chateau de Jazzy) been since the unveiling of the PetFusion Ultimate Cat Scratcher Lounge? The only downsides I can see are that eventually it will have to be replaced (as with all cardboard scratchers), and with all the action it gets, there's quite a bit of shredded cardboard on the floor. Jazzy seems to enjoy eating these pieces of cardboard, though, so he's doing his part to clean up after himself. Jazzy's claws are less terrifying (he is very resistant to having me clip the pointy ends). He requires fewer play sessions that involve me each day (he's a very active cat). 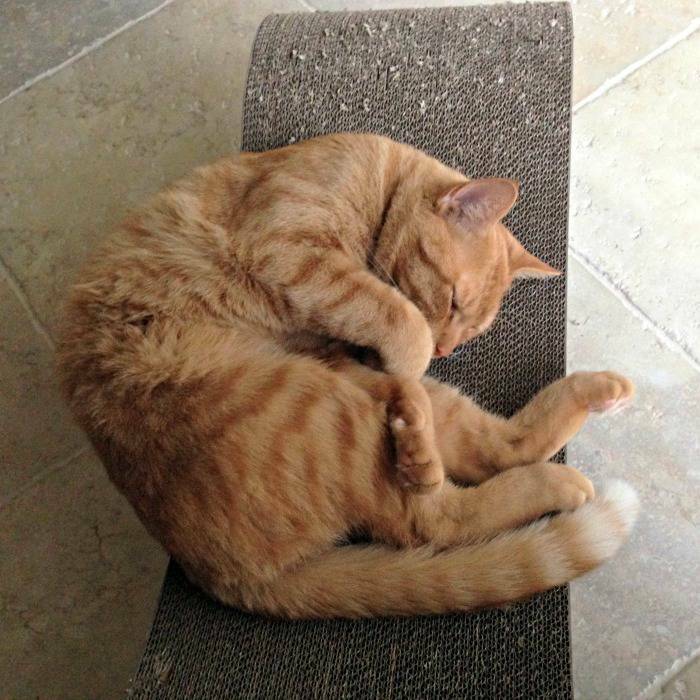 He hasn't tried to peel back the carpet near the bathroom door (one of his favorite spots) in days. The Lounge is now one of Jazzy's "go to" scratching spots. It's also a "play center" and is used as cover to stalk toys (and me... insert evil laugh here). When he's running around the house like a crazy cat, he's more likely to jump on the Lounge than the couch. He's using his old, flat cardboard scratcher more often. In short, things are better. Don't get me wrong, things weren't "bad." Jazzy is a great cat, totally adorable, and a champion snuggler. But, he can be a handful sometimes, so a product that can help him take out his aggression and not damage my house is a welcome addition. Of course, no one single product is going to be a cure-all for what we may perceive as cat behavior problems, such as climbing the furniture or scratching the arm of the couch. The more things we can do to simply let cats be cats, however, the closer we are to a happy cat, and the less we see the behaviors we don't want. Since scratching is such an essential core feline behavior, the more outlets we give our cats for doing so, and the more "appropriate" scratching surfaces we have in our homes, the better. We've had the PetFusion Ultimate Cat Scratcher Lounge more than 6 months now, and Jazzy loves it. He sleeps or lounges in it often, and scratches on it several times a day. It makes a great spot for me to drop a little catnip for him to enjoy, and an excellent spot for him to end one of his mad dashes around the house with a good scratch. Solid construction and has stood up to many beatings by Jazzy the Rescue Cat. Lightweight so it's easy to move from one location to another. It's a cardboard scratcher, so many cats will enjoy the feel. Jazzy uses it all the time for more exercise and more play, as well as a favorite bed. Same as before. Little pieces of cardboard. Like all cardboard cat scratchers, it leaves pieces of cardboard on the floor. This new scratcher gets lots of action, but sometimes, though, it's just a good place to relax and lounge about, something Jazzy is very good at. If your current appropriate scratching surfaces aren't quite cutting it, you can buy a PetFusion Ultimate Cat Scratcher Lounge at Amazon. Click "Save" to pin this image to Pinterest so others can share in the love.